The second Seadragon (SSN-584) was laid down on 20 June 1956 at the Portsmouth (N.H.) Naval Shipyard; launched on 16 August 1958; sponsored by Mrs. Robert L. Dennison; and commissioned on 5 December 1959, Lt. Comdr. George P. Steele in command. Following a Caribbean shakedown cruise, Seadragon returned to Portsmouth, whence, on 1 August 1960, she sailed for the Pacific. Ordered to proceed via the Northwest Passage, she moved north to Parry Channel; reached Lancaster Sound, the eastern end of the channel, at mid-month; and continued westward with Edward Parry's journal, written in 1819, as a guide. Collecting oceanographic and hydrographic data en route, Seadragon transited Barrow Strait, Viscount Melville Sound, and McClure Strait. On 21 August, she completed the first submarine transit of the Northwest Passage; entered the Beaufort Sea; and headed for the North Geographic Pole, which she reached on the 25th. From there, Seadragon turned south; and, after conducting experiments in cooperation with scientists on ice island T-3, headed for the Chukchi Sea and Bering Strait. On 5 September, she reached Nome; and, nine days later, she arrived at her home port, Pearl Harbor. She was awarded the Navy Unit Commendation for her transit of the Northwest Passage via Parry Channel. For the next nine months, Seadragon was employed in local operations. In June 1961, she headed west for her first tour in the western Pacific, during which she participated in 7th Fleet exercises-primarily antisubmarine warfare training exercises and completed a submerged endurance cruise of 58 days. In October, she returned to Pearl Harbor and local operations. On 12 July 1962, Seadragon departed Pearl Harbor for her second Arctic cruise. Transiting Bering Strait and the Chukchi Sea, she contacted T-3, then moved further north to rendezvous with Skate, then en route from New London. 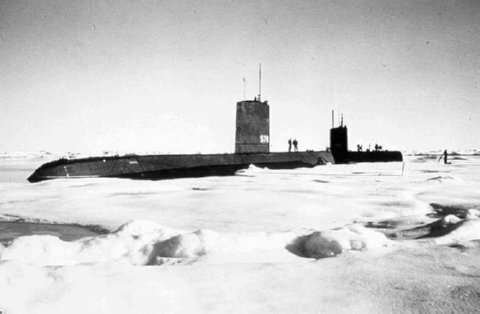 On 31 July, the two submarines rendezvoused under the ice and continued on to the North Pole, arriving on 2 August. Sonar and weapons evaluation tests, for which the submarines were joined by the icebreaker, Burton Island, followed; and, in late August, the submarines got underway for their home ports. En route, Seadragon, scheduled to call at Seattle, also rescued 12 survivors from a downed seaplane and delivered them to Port Angeles, Wash. On 14 September, she arrived back at Pearl Harbor. During the first half of 1963, the Arctic veteran participated in local operations and conducted her second WestPac cruise. On 8 July, she entered the Pearl Harbor Naval Shipyard for her first refueling and overhaul; and, in late May 1964, she resumed operations in the Hawaiian area. Torpedo evaluation tests off the Washington coast followed; and, on 10 August 1964, Seadragon sailed west in response to the Gulf of Tonkin crisis. During September and October, she operated out of Subic Bay; then, after a call at Hong Kong, continued on to Okinawa and Japan to conduct public relations cruises and participate in further 7th Fleet exercises. On 4 March 1965, she returned to Pearl Harbor. For the next four years, Seadragon continued to rotate between local operations in the Hawaiian area, training and evalution exercises off the west coast, and regular deployments to the 7th Fleet in the western Pacific. In July 1968, however, she interrupted that schedule for a 34-month overhaul and refueling period at the Pearl Harbor Naval Shipyard; and, in March 1971, she resumed her previous employment schedule, which she has continued into 1975.